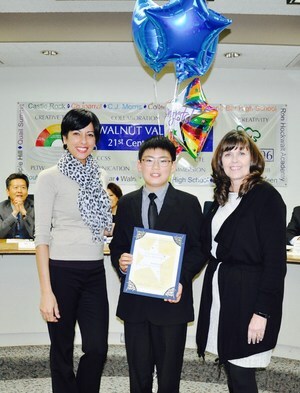 WALNUT, CA—In keeping with tradition, the Walnut Valley USD Board of Trustees honored outstanding students and partners in education during the February 21 meeting. Castle Rock Elementary crossing guard Donna Aquila received the Partner in Education Award. Donna, known as “Miss D” to students, has served the Diamond Bar campus for the past seven years. 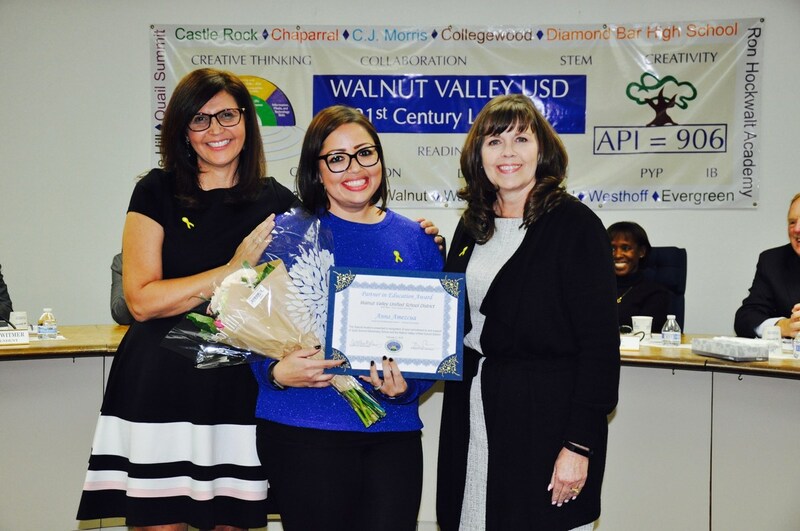 “She has built relationships with students, teachers, and families,” said Principal Dr. Resma Byrne. Donna has a special way of connecting with people whether it’s her joke of the day or sharing a personal story. The caring crossing guard even brings a pocketful of quarters each Friday to help the children purchase popsicles. “She loves our Castle Rock students,” Byrne said. Donna is described as humble, takes her job seriously, and leads her life with integrity. “She also brings staff the sweetest tangerines and homemade peanut brittle!” Byrne said. 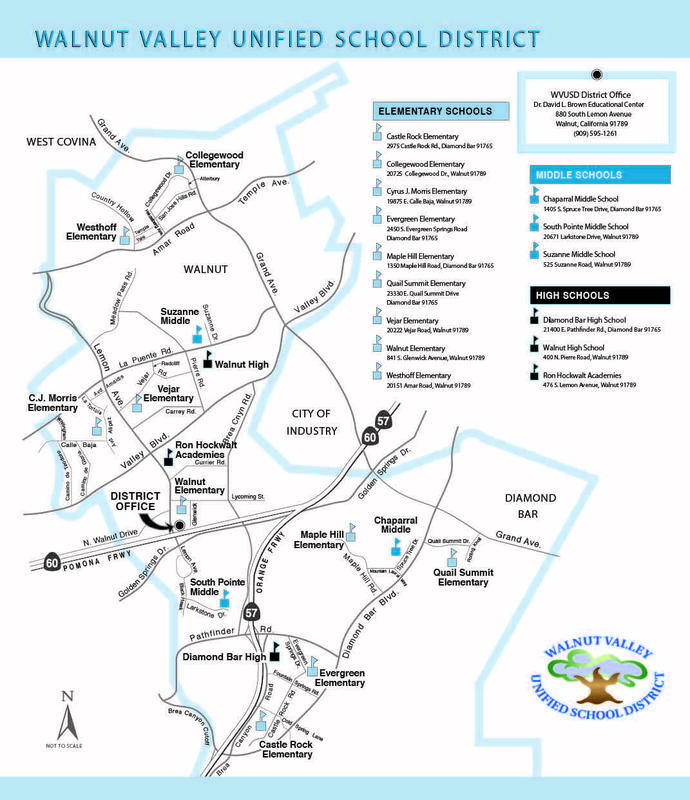 The arrival and dismissal of students is often the most chaotic time of the day. Castle Rock Elementary 5th grader Austin Lee received the Super Star Student Award.“Austin has taken great strides in learning how to take risks, make key friends, and persevere,” Dr. Byrne said. He has also learned the art of taking a failure and turning it into an opportunity. “We try to teach our students to work hard, analyze their mistakes, and learn from them,” the school leader said. This is something that’s not easy for anyone, regardless of their age. “When I look at my IB Learner Profile, I think about the traits we want our students to embody: to be caring, risk takers, thinkers, open minded, and reflective,” she described. 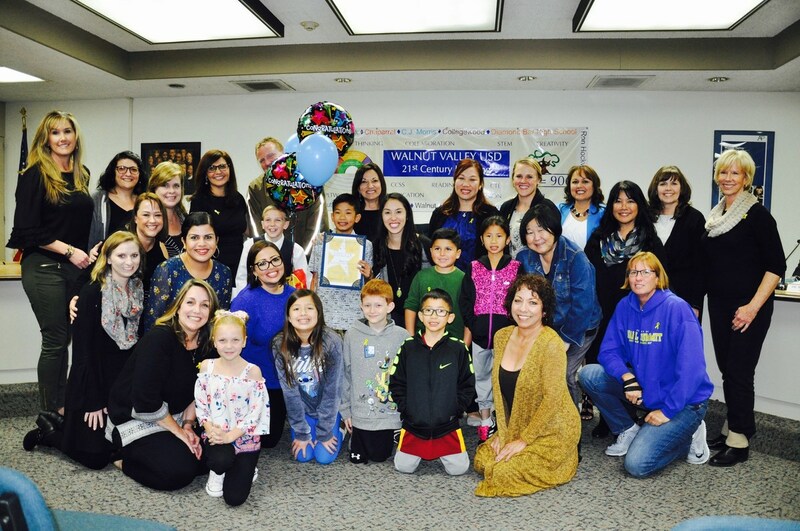 Quail Summit Elementary Community Club President Anna Amezcua received the Partner in Education Award. “In my 32 years in education, I have never seen anyone as committed to every single student as Anna!” said Principal Frances Weissenberger. Anna stepped up to fill a vacancy as president about three years ago, and since then, has totally enriched the school’s relationship with the community at large. Anna has established a welcoming environment that has set the tone for community and staff involvement. The hard-working parent volunteer continually provides support for students and is a strong advocate for school programs. She tirelessly handles her duties and has been called upon on “time and time again” to provide assistance with mother’s workshop, Santa’s Workshop, Friday Snacks, Room Parent Schedules, and more. “Thank you for all you do, Anna. I wish we could give you a car with a red ribbon!” Weissenberger said. 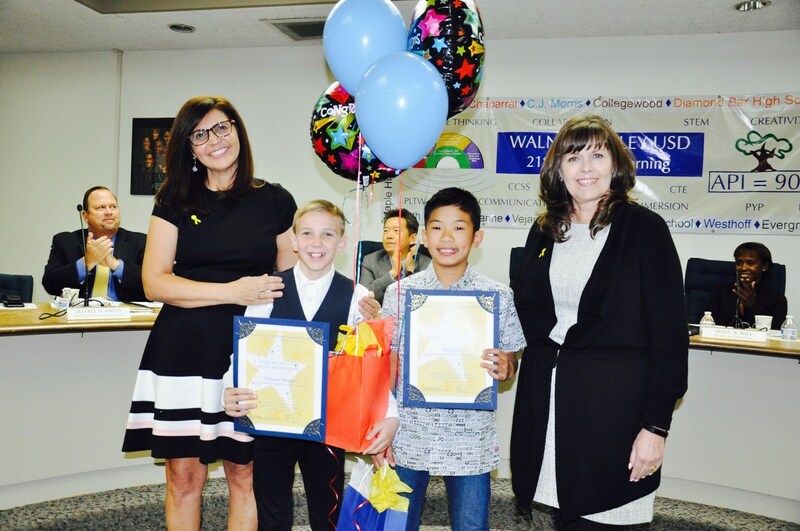 Enthusiastic, optimistic and empathetic are three words that describe Quail Summit 5th graders Tristan Skipper and Brian Vu, who were honored with Super Star Student Awards. The student leaders are rarely seen without each other and often work together to help a teacher or a fellow classmate. Tristan and Brian both interviewed for the positions of Student Council President and Vice President. “They were determined to make a difference and even told their teacher before the interviews that if they did not get a position, they would still want to be involved in some aspect,” Weissenberger said. The boys were elected and now lead monthly Spirit Assemblies and daily morning flag salute. They collect recycling every Thursday with a smile and monitor the student council fundraisers and bulletin board. “They work with other members of student council and they contribute to any other project we challenge them with great leadership and poise,” she added. Tristan and Brian also show leadership in the classroom, completing extra class jobs because they are reliable. They are always kind and including of other students. “They have grown so much over the years and are models of what Quail Summit is all about… A school with a Heart,” Weissenberger said. Castle Rock Elementary crossing guard Donna Aquila receives the Partner in Education Award. 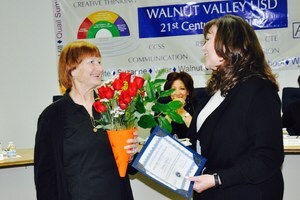 Shown with Board President Cindy Ruiz. Shown with Principal Dr. Resma Byrne and Board President Cindy Ruiz. 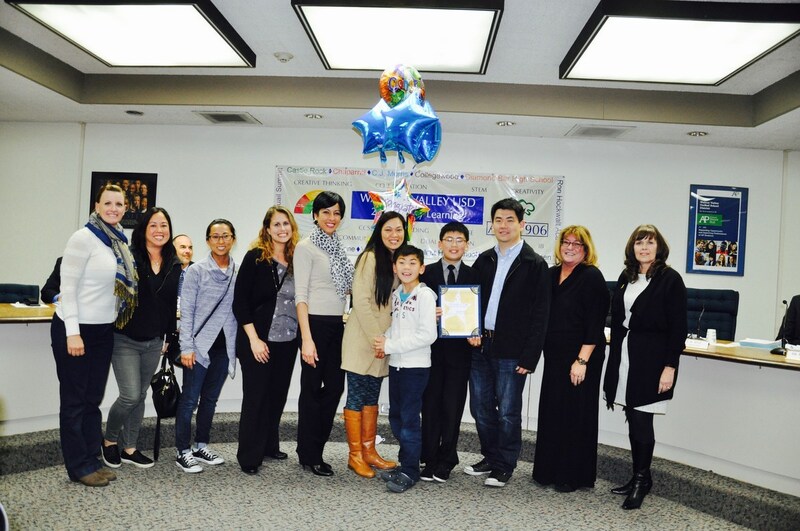 Castle Rock Elementary 5th grader Austin Lee receives the Super Star Student Award on February 21. 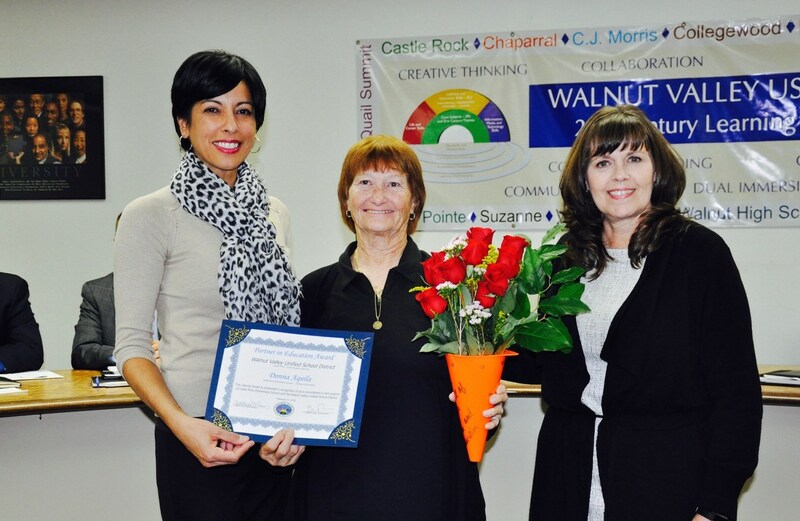 Shown with Dr. Resma Byrne and Board President Cindy Ruiz. Shown with Principal Dr. Resma Byrne, Board President Cindy Ruiz, family, and staff members. Quail Summit Elementary Community Club President Anna Amezcua received the Partner in Education Award. 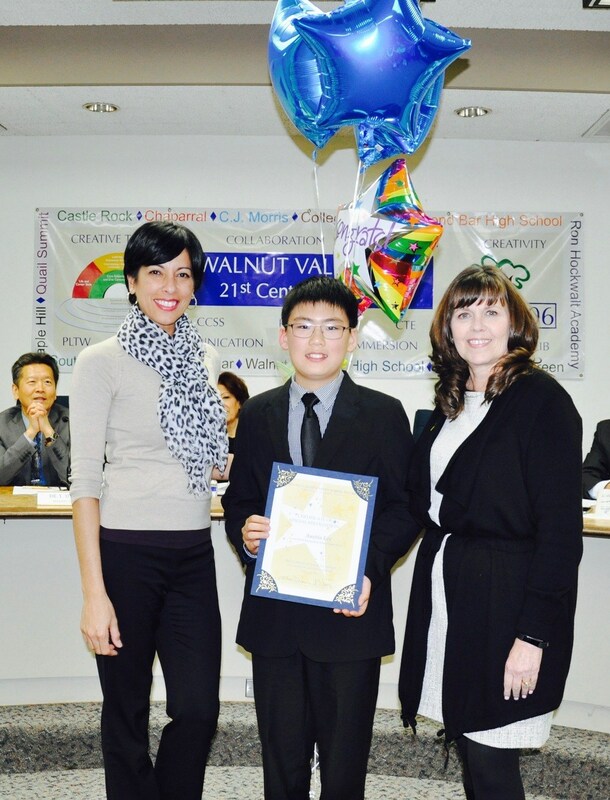 Shown with Board President Cindy Ruiz. Shown with Principal Frances Weissenberger and Board President Cindy Ruiz. 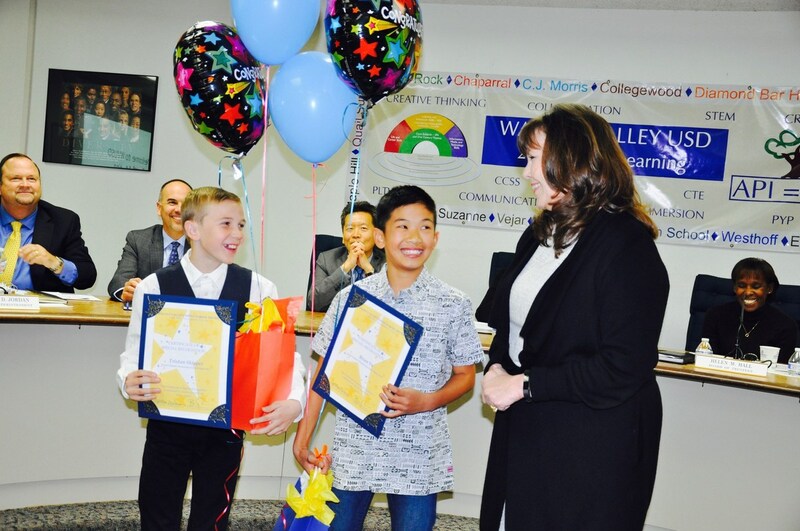 Quail Summit fifth graders Tristan Skipper and Brian Vu are honored with Super Star Student Awards. 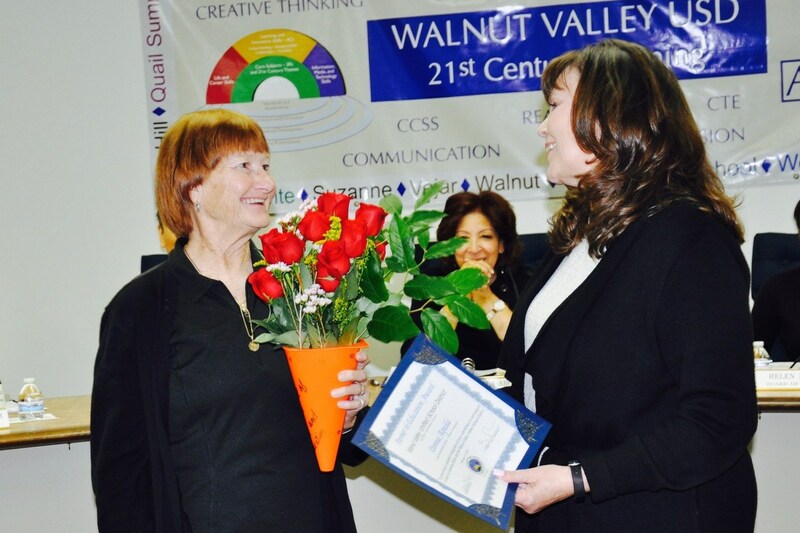 Shown with Board President Cindy Ruiz. 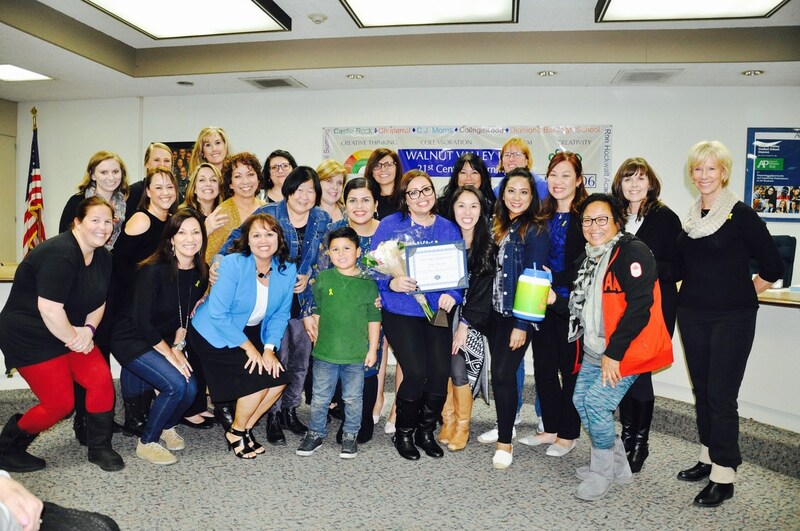 Shown with Principal Frances Weissenberger, Board President Cindy Ruiz, family, and staff members.